Yesterday’s signals were not triggered, as the level at 1.3350 was never reached. Go long following a bullish price action reversal on the H1 time frame immediately upon the next touch of 1.3145. 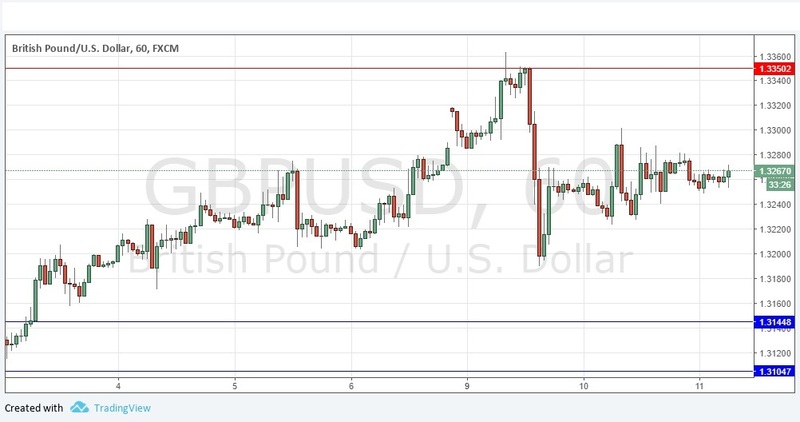 Go short following a bearish price action reversal on the H1 time frame immediately upon the next touch of 1.3350. I wrote yesterday that the price would now probably consolidate in the absence of any further political shocks, meaning that was is not likely to be a good trading opportunity here today. I had no directional bias. I cannot see any reason to change this approach as the price is now consolidating in the middle of a very wide range between the nearest support and resistance levels, neither of which have much chance of being reached. There is a lot of focus on political uncertainty in the U.K. which may affect the Pound. For these reasons, it is probably best to avoid trading this currency pair today and I have no directional bias.